Lightweight plastic shelving system for both indoor and outdoor use. No tools required as supplied for easy self-assembly. Maximum load per shelf 25kg. 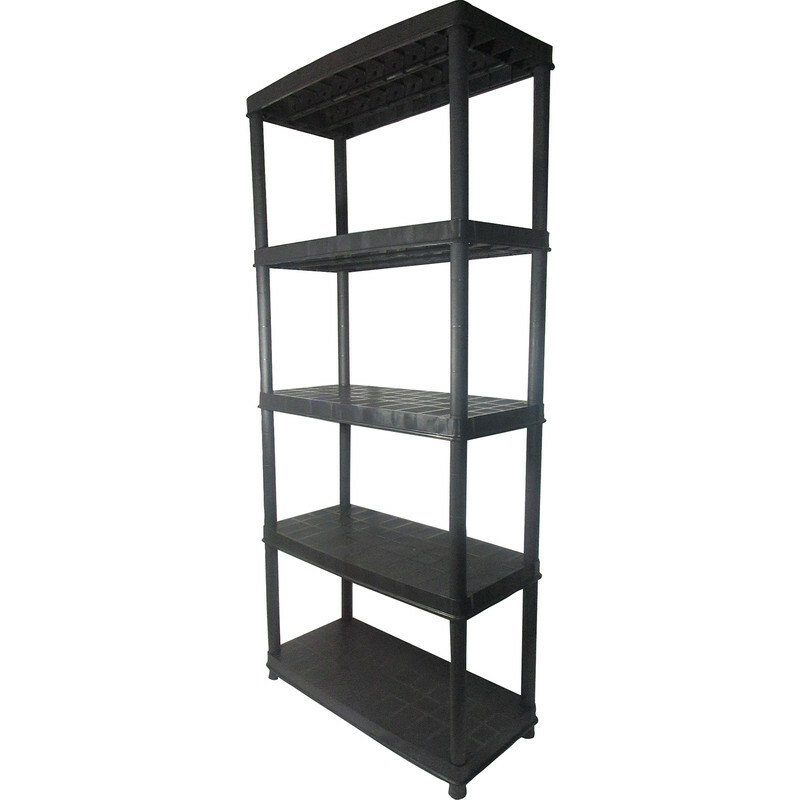 Lightweight Plastic Shelving Unit 5 Tier is rated 3.9 out of 5 by 14. Rated 5 out of 5 by Selkent from Plastic but strong I was looking for shelves to put under stairs ,I found them on line. Being restricted on the height they were perfect. Easy to put together and fast delivery. Rated 5 out of 5 by Sue21 from 'Just as it says on the tine'! We bought this shelving to house some items whilst we continue with our building work. It is strong and sturdy and take a fair weight considering it is made completely of plastic. The only downside was that there were no instructions with the item. However, it didn't take too long to work out which way the legs fitted together but they did require quite a bit of force to do so! Rated 3 out of 5 by Peteme from Ok Cheap & nasty but adequate for what I wanted. Prompt delivery to store for collection. Rated 5 out of 5 by ktmoggins from Easy to assemble I put two of these together in 30mins, no tools required although scissors are useful to get into the packaging and cut the plastic burrs on the small mouldings - feet, top caps, wall brackets & joining piece. No instructions are included but it's very obvious how it fits together. Rated 4 out of 5 by Nanny Brenda from Versatile It fits all our needs The only problem it came without any instructions. We managed to assemble it with a few bits spare not knowing where they go. But it’s up in our shed and it seems really sturdy.